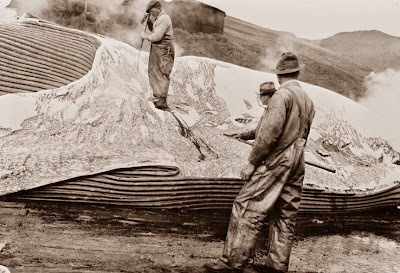 Today's picture shows a whale being processed after being killed. The picture was taken around 1940. I see a lot similarity between the hunting of whale and buffalo. Initially both these endeavors was by indigenous people who were doing it to survive, and wasted very little. Then in came commercial operations with huge waste and decimation of the population of the species, and then also stress on the indigenous populations as their food source was endangered.